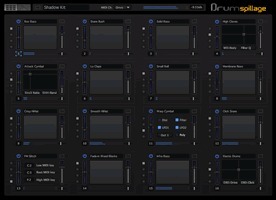 AudioSpillage has announced DrumSpillage, a new drum synth AU plug-in for Mac OS X. Inspired by early analog and digital drum machines but expanding on the original blue print DrumSpillage is equipped with a modern feature set designed for today's electronic musicians and producers. 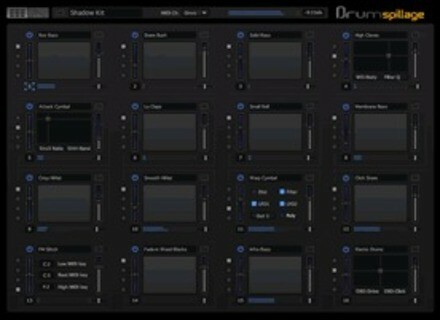 13 exclusive drum synthesis algorithms with extensive editing facilities. 16 part/64 note polyphonic percussion synthesizer. Pad based real-time control/mixing surface. Full MIDI key mapping and pad layering. Distortion unit with 6 distortion algorithms. 2 ADSR envelopes and 1 pitch envelope. 2 LFOs (6 wave shapes). Full MIDI key mapping allows synths to be stacked or played melodically/polyphonically. Realtime MIDI controller and key velocity mapping. 2 Global LFOs available to all parts simultaneously. The release date is set for 15th March 2010 with a limited number of advance orders available now for a special discounted price. The special offer prices are £75 / €89 / $119 which represent at least a 25% saving on the full retail price. You will receive your plugin on or before the official release date. IK Multimedia Shipping Amplitube 3 IK Multimedia announced that AmpliTube 3, a major upgrade of the guitar and bass tone gear-modeling software, is now shipping.